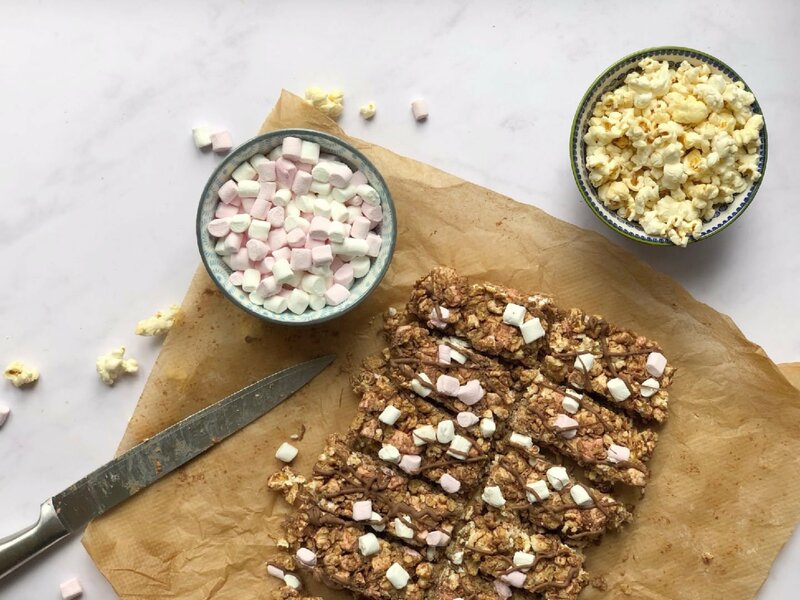 I wanted to share this ever so simple recipe for popcorn rocky road bars. Why make them when you can buy something similar I hear you ask? However I am a firm believer in knowing what’s in our food, and as such like to try new simple recipes that all the family will enjoy. But also, all the family can easily make. Yet are also lower in fat and carbohydrates making them perfect for a sweet treat, but allowing you to have control over portion sizes, fat, calorie and carb intake. When I followed slimming world I used to love the Slimming World Rocky Road Hi Fi bars, these are not the same! 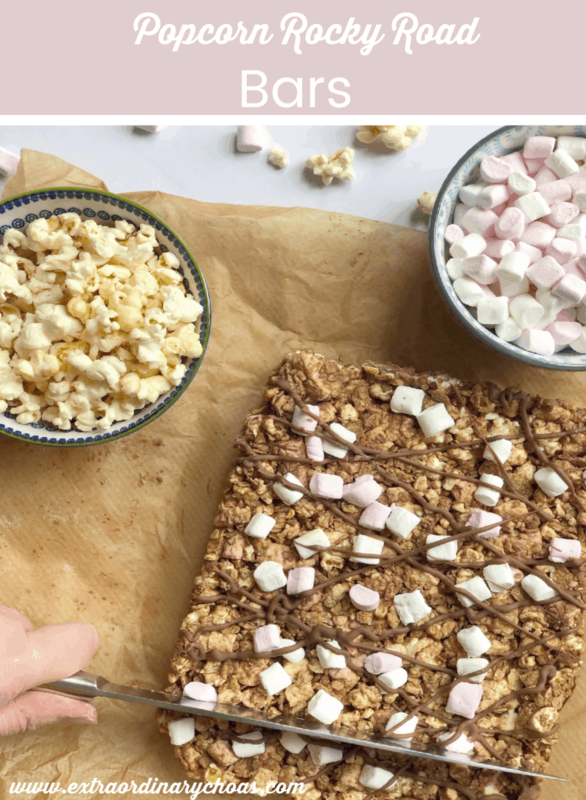 But a blooming great substitute, it’s the combination of chocolate, popcorn and marshmallow that does it for me. 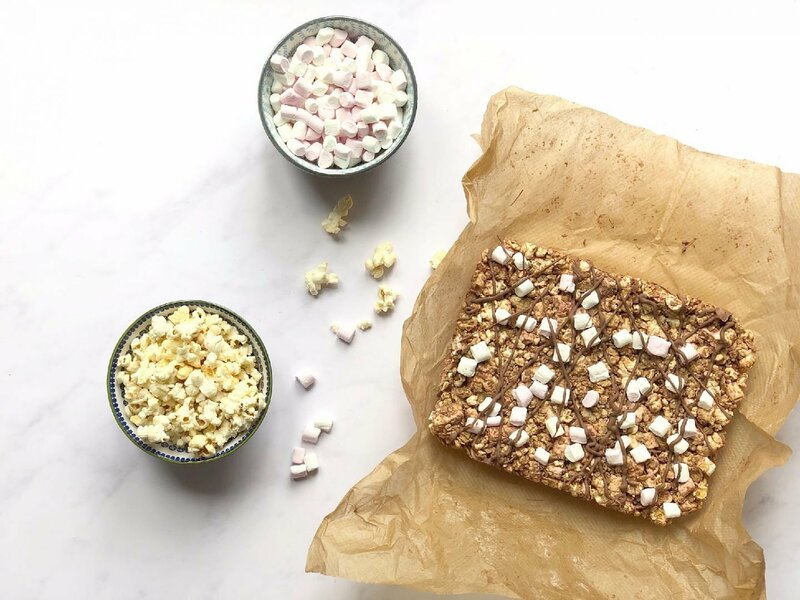 Popcorn Rocky Road Bars are perfect for when you want a sweet treat, but don’t want to ruin your healthy eating plan? 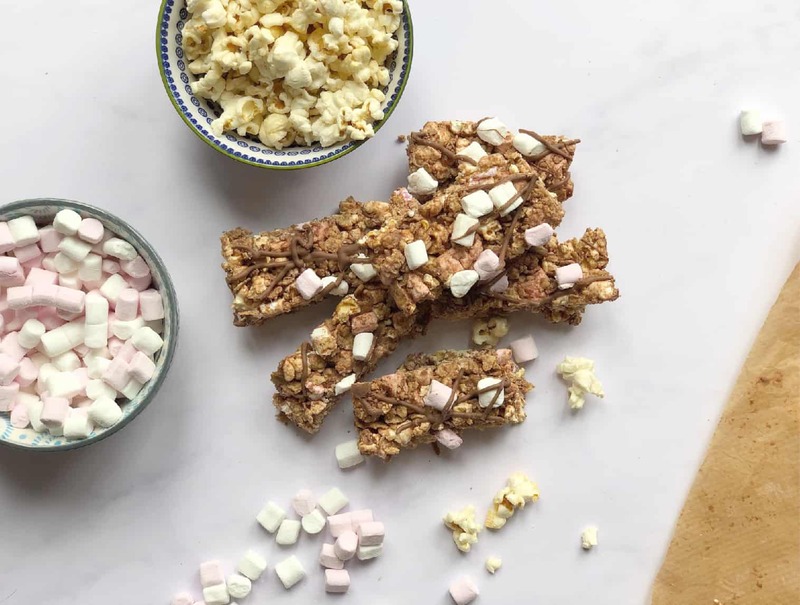 These super easy and delicious popcorn rocky road bars are perfect. 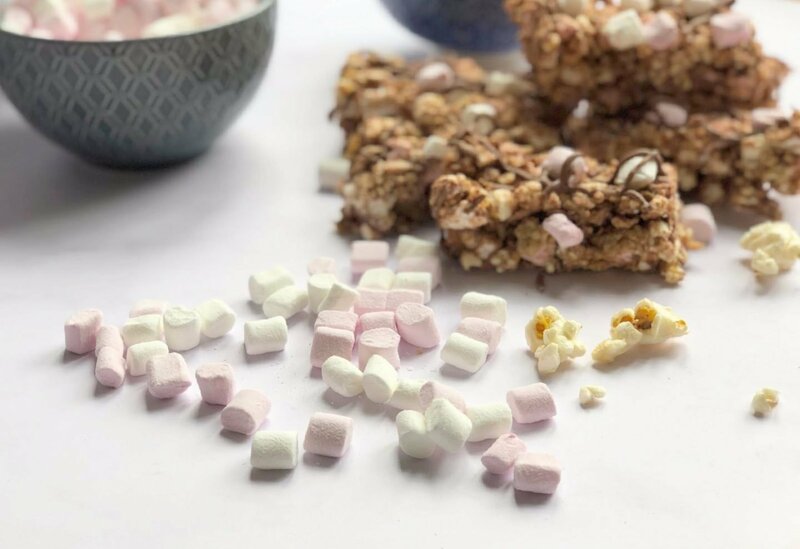 And are also a great snack for kids, I cut my batch into 12 portions thinking they would be handy cereal bar size. Alternatively cut them into 24 bite-size pieces, perfect for kiddies party food, or lunch time snacks. Having a teenager with type 1 diabetes who LOVES chocolate is not a winning combination! It’s difficult to find chocolate snacks that are lower in carbs, however in small portions these offer that chocolate fix teenagers want without overloading on carbs. Ok no carbs is always better, but find me a diabetic teen that doesn’t try to sneak treats in? Anyhow I digress, family sweet treats are all about moderation and knowing what you are eating so you can make and informed choice. And giving our boys options about what they eat works for us. I find denying treats at all created that irrational desire to have what you can’t have. 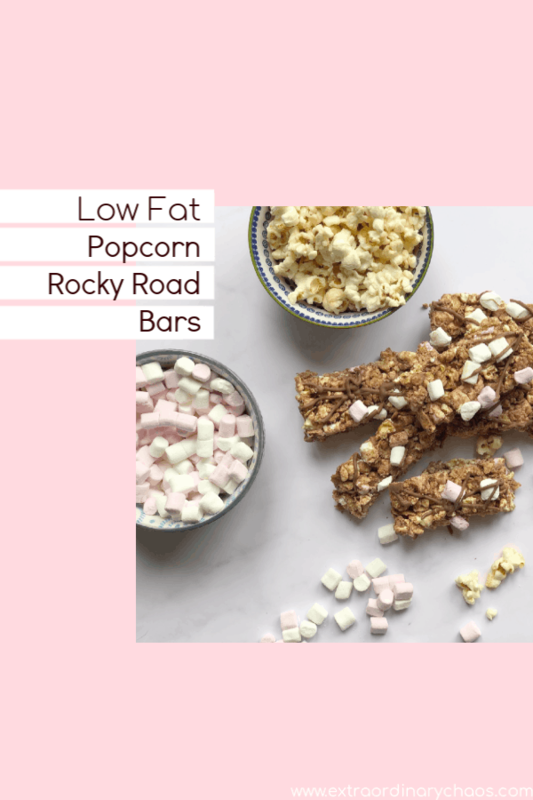 So here you go, I present my low-fat and low-carb Popcorn Rocky Road Bars. But before you make them, consider how much chocolate you want to use? I used 100g to keep the chocolate, fat calorie and carb levels lower. But you can use 200g and go all out on the chocolate, this makes the bars a lot more solid. However with this in mind and to keep my bars solid but lower in chocolate I ensured I fully mixed and compressed the mixture before it went into the fridge which worked well. Put 2 squares of the chocolate to one side and melt the rest of the chocolate in the microwave, heat 30 seconds at a time until it is thoroughly melted, keep mixing throughout! Pour the chocolate into the popcorn mixture, mixing until all the the mix is covered. Transfer this to your bowl with grease proof paper, cover the top with the grease proof paper and compress as much as possible. Sprinkle the remaining marshmallows and compress again. Cool in the fridge to set for 3 hours.